When asked "What does Champagne-Ardenne bring to mind?" it is almost certain that 99% of the people asked will answer "Champagne", and the one remaining percent would be answers given by those who come from the region itself. It is sure that with such a prestigious product, known and enjoyed around the whole world and a symbol of celebration, parties and luxury, the Champagne-Ardenne region has found itself a natural and high-quality ambassador. The problem of a product with such a strong personality and reputation is that it often overshadows everything around it. Too often summed up by these famous bubbles, most people forget everything else that makes up the charm of this region. Of course, the wealthy region of Champagne (comprised of the departments of Marne, Haute Marne and Aube), with its vineyards, the cellars of its large Champagne houses often installed in limestone pits dating from the Roman era, and its capital, Reims, where 33 French kings were crowned at the heart of the Notre-Dame Cathedral, the main destination for many tourists. However, you can't forget the Ardennes, with its vast forested landscapes bordering Belgium. The homeland of Arthur Rimbaud (born in Charleville-Mézières) conceals architectural treasures such as castles and churches, which can be discovered while out on a hike. The entire region played host to terrible battles during the First World War and keeps the memory of this sad past alive in its museums and on the land. Fortunately, the region's past is not entirely made up of wars. Man has left many signs of his know-how ('Maison de l'Outil et de la Pensée Ouvrière' is a special museum dedicated to this subject), of his will to live on this wild, sometimes harsh land, and of his continuous amazement in regards to the generous nature afforded by the region (such as the artificial Lake Der-Chantecoq and the Forêt d'Orient). A land that is both wealthy and rustic, the gastronomy of Champagne-Ardenne is not summed up merely with Champagne. Ardennes ham, Rethel black pudding, wild boar, St. Ménehould-style pig's feet, and the pink biscuits of Reims are as much of a treat for the mouth as the landscapes are for the eyes. 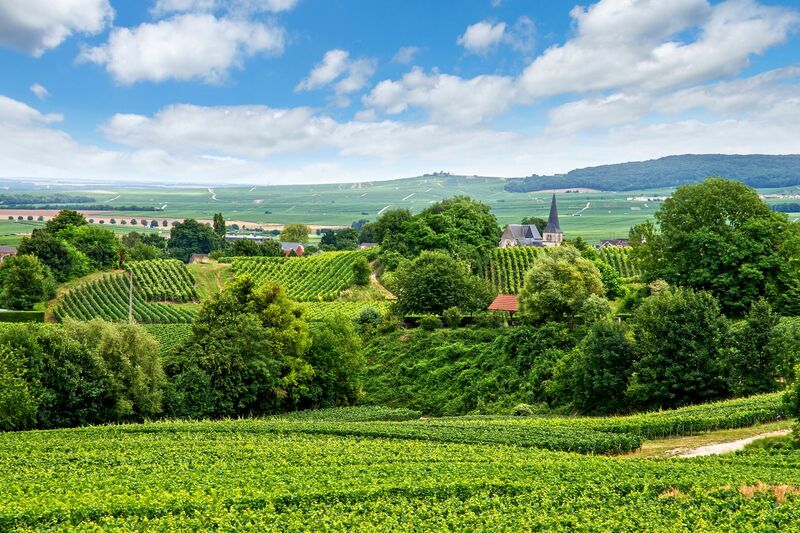 With its relatively harsh winters, especially in the Ardennes and on the high plateaus of the Marne, the Champagne-Ardenne region is best discovered in summer. The beginning of autumn is also a pleasant period, one during which you can discover the region to the rhythm of the grape harvests, an important time of the year for this land of vineyards. Of course, when you think about Champagne-Ardenne, you can't help but think of the drink with fine bubbles that is produced here. World renowned, champagne is emblematic of the region and notably of the city of Reims. From the discovery of the vineyards and their landscapes to visiting the most famous wine cellars in Champagne (Mumm, Pommery, Taittinger, etc.) oenotourism is an important part of the culture of this region. Most of the big name producers, but even the less known ones, propose guided tours of their cellars, some of which are even located in old chalk quarries. These guided visits are done in groups and it is recommended that you make a booking in advance. We also recommend that you bring along an extra layer of clothing when going on a tour, even in the middle of summer, since the temperature in the cellars often hovers around 12-13°C. It may be essentially known for Champagne, the region does conceal some other treasures that range from architectural to cultural to gastronomic. Reims, the city of coronations, with its cathedral, its Palace of Tau and its Museum of Saint-Remi is worthy of a visit all on its own. In fact, many foreign tourists have already caught on to this and often make a stop in Reims on their way to the French ski slopes in winter or the French Riviera in summer. It is thus recommended that you book your hotel in advance to be guaranteed a room, especially during the school holiday periods. To really immerse yourself in the history and architecture of the region, it is essential that you visit the medieval city of Troyes, the route of timber-frame churches, the Abbey of Clairvaux and Châlons-in-Champagne. Since culture also includes cuisine, many of the local products are sure to end up on your plate and in your luggage, such as Champagne (of course), Troyes andouillettes, Haute-Marne truffles, Reims mustard, pink biscuits of Reims and Langres and Chaource cheeses. Find weekly weather forecasts for Champagne-Ardenne . Different criteria make it possible to predict with precision the best time of year to go to Champagne-Ardenne . A comprehensive weather score, made up of temperature indicators, bad weather predictions, sunshine levels and wind speeds, will allow you to choose the activities best suited to the weather conditions and therefore make the most of your holiday in Champagne-Ardenne .